CashHopper: AseBux - Ace your clicks!! AseBux - Ace your clicks!! AseBux is one of the latest PTC to hit the ever growing PTC universe. It is similar to the top PTC sites like NeoBux, ProBux, Clixsense, NerdBux, etc. featured on this blog. Next you will see the following page. 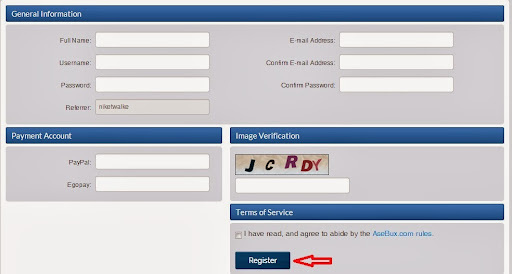 Click on Register marked with the red arrow. You should see the page below. Fill in all the details like username, password and PayPal address as described by me in my First Post. Next, click on Register marked by the red arrow. You will then receive a confirmation email with an activation link. Once you click on that link your account will be instantly activated. You can now start making money clicking ads!!! AseBux is a brand new site hence the options of earnings are limited for the time being. Having said that, as the site continues to grow it will add more options. Currently, in addition to clicking ads, you can earn money by doing Sign Up offers and playing the "AseGrid". I have created a simple guide to increase your earnings in the grid game. Make sure to check it out at the Grid Game Guide. 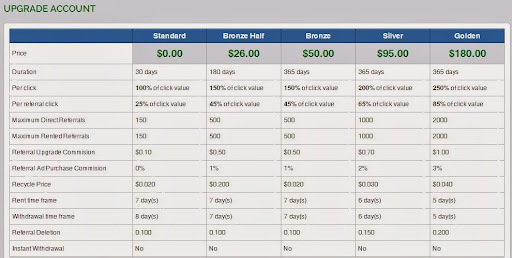 The Sign Up section basically pays you to join more PTC sites using a referral link. Point to note is for the free Standard membership, there is a cap on the number of Direct and Rented referrals i.e. Max 150 Directs and Max 150 Rented. I don't think that should be a point of concern though, as it should be enough for us to save money and upgrade to the Silver membership valued at $95. I have listed some strategic guides about making consistent money from PTC sites. Do check out the ProBux, NeoBux, NerdBux and Clixsense guides. They have a ton of info which you can easily apply to AseBux as well. Also note that the withdrawal is not instant meaning once you place a request you will get the money in 5-8 days depending on your level of membership. I agree AseBux is a relatively new entrant to the PTC universe, but I think it has a lot of promise. Also, it has a low minimum pay out threshold of $2 which means any time your account balance reaches $2 you can withdraw it in you PayPal account. In case you do not have a PayPal account and don't know how to get one, do go through the step by step guide at All about PayPal. I would encourage you to go through my article on Working with New PTC sites. I would be the first one to admit that like elsewhere on the Internet, the PTC world is not without it's share of Scam sites. But, I think, with a little bit of common sense and patience, we can make good money and withdraw and pump in our top PTC sites to earn more money. Do read my article. It will present a clear common sense picture of what needs to be done and how to do it!!! Like always, don't forget to browse through the Forum and FAQ sections on the site. I can't reiterate how much value they add. I do it every time and so should you. Thats it! Though a new entrant, AseBux has already shown a lot of promise. This PTC can only get bigger in the time to come. I certainly hope so. In the mean time we can make good money off it. So join me in becoming part of the PTC revolution with AseBux.